still be available as a pre-owned/recertified model at a great cost savings. BA-704 Pre-owned / recertified. Call foravaiability and discount pricing. 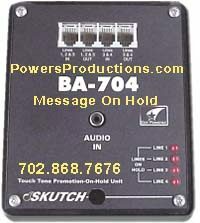 Skutch BA-704 The BA704 Music/Message On Hold Adapter can handle one, two, three or four lines, to give you Music/Message On Hold ability for your KSU-less phones. This version of the BA-704 Music/Message On Hold unit was designed specifically for three or four line KSU-less phones (one or two line phones may use the BA-704, or the BA-704-2, made specifically for one or two line phones) to provide you with as quick and painless a connection, of this system, as possible. This system connects directly to the telephone lines and can be used by all of the phones on its lines. You place someone on hold, through the BA-704 Music/Message On Hold unit by pressing the STAR key, and then hanging up that phone. You then pick up the line on that phone or on a different phone without hassle. This unit lets your message sound its best "On-Hold" from Cassette Players, CD Players, PC Sound Card Output, or any Powers Productions Digital Player (including our Pre-owned models)... in fact, the BA-704 is looking for any kind of audio you would like to supply it. The BA-704 Music/Message On Hold unit is much better than most any other telephone Promotion-On-Hold adapter currently on the market, short of buying an expensive telephone KEY system (PBX/KSU). NOTE: An external audio player is required to feed Message On Hold audio into the BA-704. Please call us for ideas and pricing.). If you are using 1 or 2 lines please see our BA-704-2 "Universal Star Key" unit. or the upgraded EX-704-2.